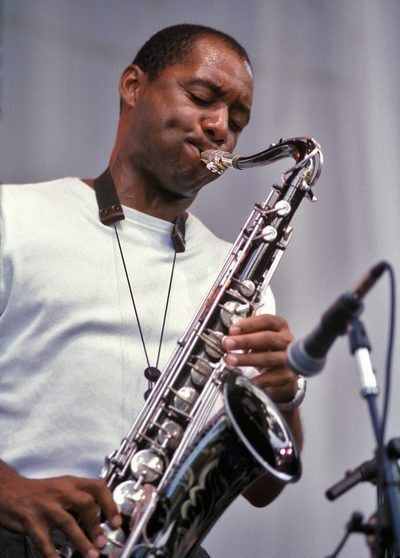 As the picture gives away, The Dead were joined by a guest who pushed all the right buttons and hit all the right notes on this night, Branford Marsalis. Branford had joined the group on multiple occasions in the past including the epic "Birdsong" which appears on Without A Net, and he would continue to pop up, playing with the group a total of 5 times. This one was the midway point and the peak of the mountain if you will. The band gels with the horn seemlessly throughout as he manages to push and pull the fellas in directions they hadn't traveled in years. Their are multiple versions of this show on the archive, some Matrix's that are sweet, but I posted the version that I have had and listened to over the years, and consistently go back to. All of them are crisp and in the A+ range for sound, the difference being how much audience do you want. You get some in today's posted version, more in others, feel free to find your favorite, this is mine. This is a magical night and it starts right from the opener. This version of "Shakedown Street" is one of the all timers, maybe because it signals such a great show to follow, but to these ears the band hadn't been this funky since the early 80's and the horn is the main reason why. The crash to start things off gets the stage a rocking and Branford's interjections are all flowing and gorgeous with Hornsby adding to the mix on piano and Phil's pumping bass lines. This town had a bunch of heart on this night with even Vince getting accented and acquainted with Branford. The hugeness of sound is there in there with everyone soloing and chasing the 9 minute mark; it never once feels like an overloaded experience even with the wah-wah's, echoy effects, sax, two sets of keys and rambling drums. The blues of "C.C. Rider" comes next, and acts as Bobby's first singing contribution on this night and his vocals would play an important part as Garcia's guitar lines and Branford's Sax flights would back them. The sound is surprisingly crisp on these clips and the site of the band adds another dimension to this epic night in the Garden. The group stays in the bluesy cover vein as they slide effortlessly into Dylan's "It Takes A Lot To Laugh It Takes A Train To Cry" and I can say without equal that this is my favorite version the group produced in regards to the classic tune. Never one of my favorite tunes but it is hard to complain with the way Branford approaches this one; the fact that he plays a Soprano Sax on this one just ups the cheesiness, but really that is what it is all about and works wonders. There seems to be a bit of an extra stomp from the Drumming crew on this version as well. The opening combo use to be the B-side to my first tape and I always used to listen to it and marvel, the "Help on The Way>Slipknot!>Franklins Tower" just explodes and lets the crowd instantly know this wasn't a one set trick pony of a show. One of the main reasons I picked this version off archive to present is the fact that the 3 tracks are presented together as one 23 minute whirlwind as I feel it should be. No need for glitches or little clicks with this one, as Phil's loose monster Bass causes dancing in the aisles. Branford seems to be a bit behind in the structured sections but laps up the jam parts and makes his statement loud and clear. Hornsby gets into the act perfectly here running with Garcia and Branford around the higher end of things around the 8 minute mark while the Rhythm Devils, like always, refuse to quit. Things start to get freaky around 11 minutes in before the rise and majestic fall of "Slipknot!" into the composed breakdown that ends the tune before the joy of "Franklin's Tower" takes hold and refuses to let go. Hornsby's piano leads through the darkness as the band casts a bright light on the crowd and end a pretty snazzy group of tunes. "Estimated Prophet" is up next and while being one of Bobby's best jams this is good but maybe not as great as some of the other songs on this night...could be because they knew what is in store for the crowd next, "Darkstar". Such is the treat of 1991, the popping up of "Darkstar" and on this night Branford gets to play along to the bust out with wondering excursions and various interplay from all the members. At times paper thin this version seems to be searching the city night for the right in-roads and everyone gets to take a sot with Branford sounding more comfortable then perhaps he has all night. When the group coalesce before the 11 minute mark their are glimpses of magic stars from the past floating all around. The "Drums>Space" sandwich fits easily into the song and allow the band to explore outer regions of sound before dipping back into the familiar refrain for 12 minutes more of the "Darkstar" work out complete with lyrics and invention. All of this is great! Grand! and we even get the Accordion ladled encore of "It's All Over Now Baby Blue" to end the night....what a treat, what a show. 9-10-91 is easily one of my personal favorites and a recording I will constantly go back and listen to and watch. Here's hoping you enjoy this special night in Dead History.